CasaPound demonstration in Ostia, 2017. Credit: Carlotta Chiaraluce/Facebook.In November 2017, the Italian edition of the women’s magazine Marie Claire published an article entitled “Do you know who CasaPound’s women are?” It profiled female militants of the Italian far-right group, which was born in 2003 in Rome, giving readers a glimpse into their private lives, sharing fashion tips, what they like to wear, and how they juggle their family and social lives with the demands of being part of a violently fascist movement. 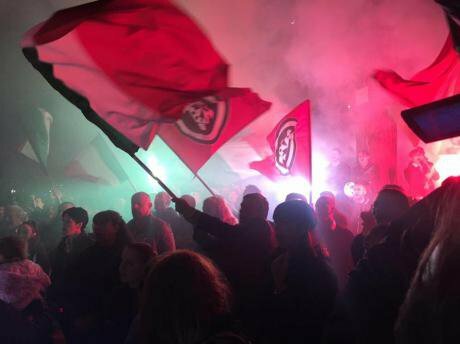 Over the past five years, CasaPound Italia (CPI) has sought to build new political credibility and clean up its image in order to penetrate mainstream Italian political debate. And the media have played their own, starring role in this project, helping to normalise and even ‘glamourise’ the far-right movement. November was an important month for the “third-millennium fascists” – as CPI militants have defined themselves. A few days after the Marie Claire article came out, citizens of the Roman suburb of Ostia were called to vote on whether to renew their local administration (which had been dissolved in 2015 due to mafia infiltration). The election was considered by Italian media as “a test” for the affirmation of CPI in Italian political life. The movement fielded candidates in Ostia’s vote, and is now eyeing seats in the national parliament – with elections planned for March 2018 – confident they have a chance to succeed. In Ostia’s election, CPI got 9% of votes and obtained one seat in the local municipal council. These numbers are not big, and only 36% of citizens voted – but they received huge attention from the media (also because a member of one of Ostia’s crime families, who happened to support CPI, broke a journalist’s nose with a violent headbutt). 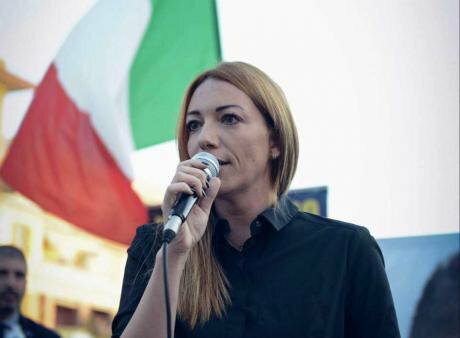 What also stood out in the suburban election was the central role of the local spokeswoman Carlotta Chiaraluce, partner of CPI’s local municipal candidate and now neo-member of Ostia’s council Luca Marsella. Carlotta Chiaraluce. Credit: Carlotta Chiaraluce/Facebook.Chiaraluce’s media profile is meanwhile growing steadily: in early January, she was invited to be a regular commentator on a political talk show on Rai3, a national Italian TV channel (though she only lasted a week). The anchorman of the talk show, known for being on the left of the political spectrum, “understood that he could not ignore us,” she said. Chiaraluce was also among the CPI women profiled in the November Marie Claire spread. Her life “is made of work, her son, stage [she is a singer] and politics,” it gushed. Another CPI militant was described in the magazine by her “outfits inspired by the 1950s,” because “fashion is subversive, it can really be a revolutionary expression, a political message, an expression of creative freedom.” Her proximity with left-wing groups when she was younger “bothered her aesthetic sense,” it said. A third CPI militant, from Milan, is described as a “thirty-something woman, tattooed, no-frills, no makeup, no-ius soli” (referring to CPI’s opposition to a law that would create an earlier path to citizenship for children of foreign parents born and schooled in Italy). The article also described this militant’s parents’ reaction to her choice to join CPI, and that while her father reproached her many times – saying that her grandfather had been killed by fascists, and that she should be ashamed of herself – her mother was more accepting. “As we’re not illegal, we’re not anti-constitutional, we don’t beat anyone up, when I have meetings my mother gladly watches my children,” she said. CasaPound Italia demonstration in Bolzano. Pietro Chiocca/Wikimedia Commons. Public Domain.Another woman featured in the Marie Claire article is Emmanuela Florino. She's described as “another thirty year old, mother. From Naples. Different from the others. A woman with cazzimma” – a dialect expression for foxiness and the ability to get by in any situation. What the article overlooked is Florino’s involvement in a 2013 investigation that led to the arrest of far-right extremists (most of them from CPI) accused of subversive association, violent attacks on left-wing activists, and possession of illegal weapons. “This article is pure propaganda,” Cammelli told me. She noted, for example, that the pictures of the women were taken by a CPI militant – Alberto Palladino (known as “Zippo”), who was sentenced to more than two years in prison after a 2011 attack that sent five Democratic Party activists to hospital. “Secondly, these five female figures are put there just to say that you can be a woman and be a CasaPound militant at the same time,” she said. But why is CPI so concerned with showing the commitment and coolness of its women? Why is CPI so concerned with showing the commitment and coolness of its women? According to Caterina Froio, associate professor at the European School of Political and Social Sciences in Lille, France, what CPI is doing has to be viewed within the wider European context. “In this respect, CPI is not an outlier,” she told me. This phenomenon is exemplified by French party Front National (FN). “In 2002, when the FN was headed by Jean-Marie Le Pen, the party won a far larger share of men’s votes than women’s. In 2012, by the time Marine Le Pen became the president of the party, the gender gap had basically vanished,” Froio explained. Dutch scholar Cas Mudde has similarly said that, “for a radical right politician it can be actually very good” to have a female leader. In March 2017, Nina Moric, a former Croatian model who has worked in Italian showbusiness, declared her support for CPI. Soon after, she began to appear at many public initiatives of CPI (thus attracting plenty of journalists) and she also contributed to campaigning for the Ostia election. In recent months in Italy there has been significant debate on how the media should cover fascist and far-right movements. This is a cyclical question in the country, at least since the second world war. CasaPound in Rome. Jose Antonio/Italian Wikipedia. (CC BY 4.0). Some rights reserved.The slogan used to promote the event – “CasaPound, where the debate is free” – reflected the initiative’s aim: to present the movement as open to all opinions, respectful of democracy and its rules – unlike anti-fascists that fight CPI's presence and the hate speech they espouse under the guise of rights to freedom of expression. This new dress attempts to put in the background the movement’s history of violence and xenophobia that has characterised it since its foundation – elements that CPI have often used to gain space in the media and on social media. And the strategy apparently worked. Two prominent journalists accepted invitations to the debates (one of which was moderated by Chiaraluce), claiming that since CPI is participating in elections they are “legitimised by democracy” – while leaders, members and supporters of the movement started to land more appearances on national TV. Though the media are giving significant space to the movement, journalists seem reluctant to use the “F-word”, especially when reporting episodes of violence or assaults, even when dealing with political groups that define themselves as fascist – as CPI does.